MSA brings the biggest UK Muay Thai show ever! Just got this from the busy promoters of MSA. Looks very promising! MSA brings you the biggest muaythai show ever in the UK! 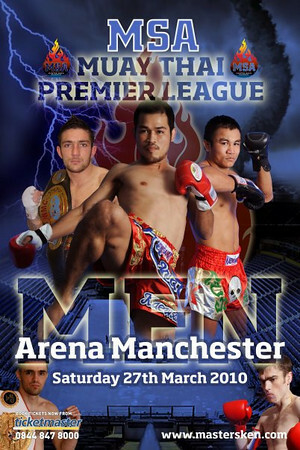 Taking place at the Manchester Evening News Arena in the heart of Manchester, MSA Muay Thai Premier League will be the biggest show to ever take place in the UK. Harrison, arguably England’s best pound for pound, is out for revenge having lost previously to anuwat on a super show in Jamaica last year. Both of these two only know one way to go and that is forward. Bovy Sor Udomsorn is regarded as one of Thailand’s most exciting fighters ever. These two old adverseries, two of Britain’s best ever, return from several years out just to fight at MEN Arena and settle the score. The long awaited contest between two great technical fighters as Keddle makes his return to the ring, a guaranteed elbow fest. All fights are contracted and with two other fights to be announced, this is certainly the card of the decade! ~ by fatsoking on March 14, 2010.